We thank POLITICO magazine to include link to our pages in its article, thereby allowing us to address their readers. It is a great example of free press. At first, we must agree with Mr. King in his claim that “The single market was not built for the free circulation of Kalashnikovs.” That’s true. And that’s why KALASHNIKOVS ARE ALREADY BANNED FOR 25 YEARS, along with all other machine guns. We wonder that the Commission does not know that, since it was them who wrote it into the law. We also note that one of mandatory steps in legislative process is to prepare impact assessment, an expert study that gives Council and Parliament information about problem and about consequences of proposed changes. It is duty of the Commission to prepare this study. However, Commission didn’t present any impact assessment in this case. Instead, they use political pressure on both legislative bodies to accept COM proposal without impact assessment. It must be also noted that current Firearms Directive from year 2008 assigns the Commission duty to issue common rules for deactivation of firearms, which would prevent illegal reactivation, and to overlook following of these rules. However, the Commission didn’t fullfill this legaly binding duty until Nov. 18. 2015 – four days after Paris terror attacks. In those seven years, hundreds, perhaps thousands of people were killed by poorly deactivated and illegally reactivated firearms. The Commission loves to call us “aggressive gun lobby”. Bad smell of that word helps them to smear us. In reality, we are just ordinary citizens, who united and organised to defend our rights against bureaucratic colossus of the Commission. We fight it in our free time and on our own hard-earned dime. Compare us with the Commission: if anybody of us would neglect his legal duties for seven years, and caused hundreds of innocent dead during that time, he would never get out of prison. And by the way, the Commission wants to avoid this situation in the future – in current negotiations about Firearms Directive, they simply refuse to have any duties from the Directive. We ask you to stand with us against this shameless bureaucracy. We are not an evil lobby; we are citizens like you, whom the Commission picked up as easy target, which they could punish for their own failures. “In those seven years, hundreds, perhaps thousands of people were killed by poorly deactivated and illegally reactivated firearms. Thousands killed? …. name them! Well, for example, all editorial staff of Charlie Hebdo magazine. That’s just for start, because the Commission was pointed out by police forces of Member States for YEARS that illegal reactivation of deactivated guns is one of main sources of crime guns. Even EC-commissioned studies pointed out to this problem. David , the Commission from the outset has failed to conduct and share the results of an impact study on their very hurriedly composed and ineptly thought through submission. From the very first day, Mr Juncker said that the legally held firearms of collectors and shooters were directly linked to the Charlie Hebdo killings. This was not so as the supplier of the weapons has not been arraigned. In fact the re-activation of the Slovak supplied AK47s was so poorly executed at least one of the weapons jammed which is totally unheard of with a normally produced AK47. If criminals and especially terrorists wish to obtain weapons for their activities they can do so easily or by even manufacturing their own. In reality most terrorist massacres have been from bombings and little if anything has been done to reduce this risk. Mr Juncker wanted to present to the world his solution to quickly address the Charlie Hebdo and other shootings by pointing the finger at legal firearms collectors and shooters and failed to address the huge stocks of illegally held firearms in the market as a result of Western and Eastern states supplying Iraq, Iran, ex. Yugoslavian breakaway states and now the Middle eastern states of Syria and Libya. 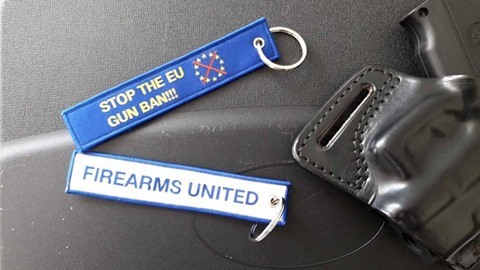 The EU made life easier for illegal arms traffickers by creating free movement between member states and of course this includes the new eastern members. If the Commission, the Council and the EU Parliament genuinely want to stop the trafficking of illegal weapons they must address the border controls that they nonchalantly removed a decade or more ago. Sadly I think that there is a more sinister side to Mr Juncker’s ill conceived plan and hence the attempt at ‘Totalitarian’ action. Keep the good work, F.U. , millions of free european citizens want to remain free.